With the start of spring approaching, Abbey Labels has already started another major investment plan for its continuous improvement in products and services to its customers. 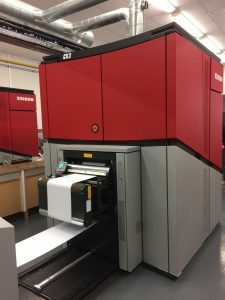 The first two of five capital investments to be announced this year, is the arrival of another Xeikon CX3 digital label printing press, as well as an AB Graphic Digicon 3 die cutting & varnishing machine. 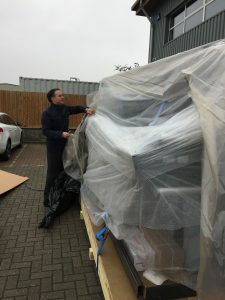 Here’s the machine arriving; our Chairman always follows tradition of unwrapping the new machine deliveries. “We feel that with the growth of Abbey Labels over the last 2 years we have needed to maintain our high service level & product standards to our customers. Therefore we have not only continued investing in our equipment but also our staff and our production facility.” says Tom Allum, Chairman. Extra administration staff plus extra production staff joined us early this year. Further production space has also been created due to the expansion of the digital department along with the purchase of our forth Xeikon Digital Label Press and seventh AB Graphic finishing machine. “Our customers are placing embellished and multi sort label orders on a more regular basis and therefore further administration and increased production capacity has been needed. The new staff and space will easily fulfil this demand and also give us plenty of room for further growth this calendar year.” says Tom Allum, Chairman. Here’s one of the new machines in all of it’s glory, after being unwrapped. 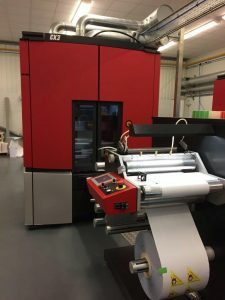 The Xeikon CX3 Digital Label Press is Abbey Labels second instalment of this model adding to the earlier machine in 2016. The Xeikon CX3 is the latest in digital label technology. It gives customers the best print quality and personalisation options. Now matched with our range of finishing options, it offers customers great choice in how they would like to embellish their labels and give them that extra special look. 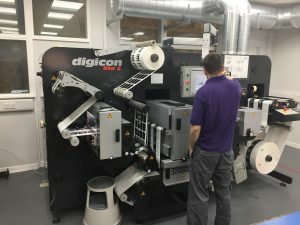 The new AB Graphic Digicon 3 die cutting machine with autoslit & varnishing gives Abbey Labels the opportunity to maintain their quick turnaround and high quality service. “This is the first two of five further investments this year. The other investments will be across the whole company from the studio; customer service; and production & will not be just concentrated on one particular product.” says Tom Allum, Chairman. This is the start of more exciting times ahead for Abbey Labels.